I had such a fantastic day out immersing myself in the Prescott Hill Climb experience that I was forced to ask myself why on earth didn’t I visit sooner? Rubbish! It look me a little over 2 hours to drive there from London. It’s actually quicker for me to get there than Donington or Goodwood. Inferior Experience To Circuit Racing? Complete crap! Each twist, turn and undulation offers a different challenge to the drivers and a great viewing experience to the spectators. You can also get much closer to the cars than on many circuits. Prescott is owned and run by the Bugatti Owners Club so it’ll be dominated by vintage motors. Garbage! It’s worth going just to see the Bugatti’s alone but I was absolutely staggered with the range of cars on display both on and off the track. I saw cars there that I’ve never even heard of before let alone seen in the flesh. Regardless of your particular preference in cars of different types, specifications or periods – Prescott offers a truly fantastic experience to see them up close, to chat to their owners and then to watch said owners blasting their pride and joy up the hill. 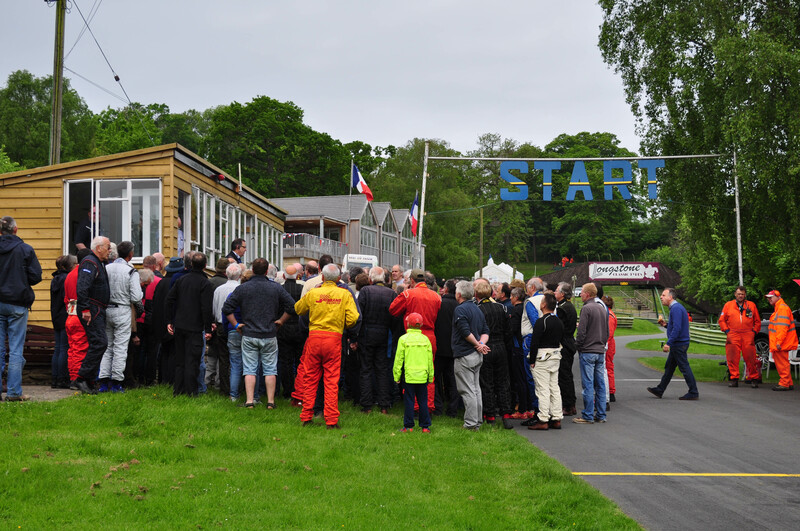 It’s a friendly, inclusive event that allows the paying public unrestricted access to the cars, drivers and great viewing points rather than being held behind barriers & fences or be forced to pay through the nose for privileged paddock access. Prescott should be at the very top of any self respecting petrol-head’s must-visit-events list. I’m already planning my next trip! 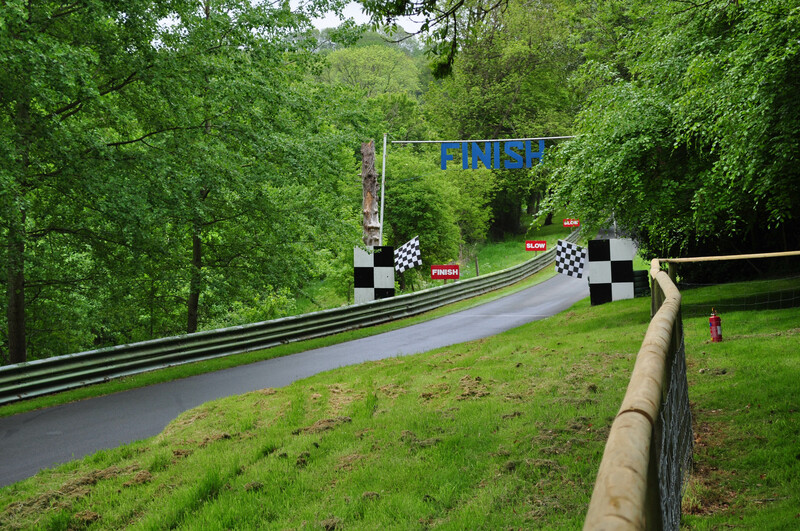 After visiting many flat or at best undulating circuits – the Prescott hill side is quite a novelty especially with participating cars scattered at all angles on the grassy inclined banks of the extended paddock. The Bugatti Owners Club bought the land on which Prescott now sits in 1937 and they organised the very 1st hill climb event in 1938 on what is now known as the “short course”. Since then it’s played host to some fantastic cars and great drivers including Stirling Moss (Prescott was his 1st hill climb in 1948), George Abecassis, Raymond Mays, and Jean-Pierre Wimille to name but a few. The unsullied countryside location, quaint collection of huts and sheds and the gathered masses of vintage and historic cars create a time warp atmosphere which feels less contrived and much more purposeful than Goodwood Revival. What really impressed me was the unbelievably efficient organisation of scrutineers, event organisers and track marshalls that made everything run like clockwork throughout the entire day. The 1st cars were going up the hill at 09:00 and apart from a lunch break there was a continuous procession of cars (and the odd gas turbine powered motorbike) gunning up the hill until early evening. Upon arrival I was immediately drawn to the pre-war cars in the paddock. I can safely say I’ve never seen anything like it. Cars going back to the Edwardian period (De Dion Bouton), aero engine specials, cyclecars, voiturettes, Bugatti’s galore (obviously) plus a number of cars I’m ashamed to say that I’ve never heard of before let alone seen. Aero-engine specials are a big favourite of mine. I admire the inspired lunacy that leads people to insert enormous aircraft engines into crude ladder chassis with sometimes vestigial bodywork and feeble brakes. I also salute the brave souls who continue maintain and compete in these monsters. Without doubt – my favourite car of the day was this Amilcar Hispano Suiza Special. Chatting to the owner/driver whilst he stuck on his race numbers – I made the rather tongue in cheek comment that it looked like a very big engine for such a small car. With great delight and a grin on his face – he explained that the 12 Litre engine came from a WW1 Spad fighter aircraft and that it was “just right” for the car. Watching the owner blast up the hill left me in awe and in absolute agreement with his “just right” assessment of the car/engine combo. It really is one of the prettiest and most potent pre-war cars I’ve seen. Early Bugatti’s are just sublime and where better to see them than at the home of the Owner’s Club. Ettore Bugatti’s artistic family background combined with his innate engineering brilliance produced cars which were both elegant and mechanically sophisticated. They were the race cars to beat (the Type 35) and the beautiful touring car to own (the Type 57 – actually designed by Ettore’s son Jean Bugatti). Being able to closely inspect such a range of Bugatti’s at the event was a real privilege and it’s a testament to the owners that they lovingly maintain and most importantly use the cars enabling other people to see and enjoy them. Whilst Molsheim is regarded as the centre of the Bugatti universe – I think Prescott is a more fitting spiritual home as it allows you to see Bugatti’s as Ettore intended – all hot and oily through vigorous use rather than concourse clean as a static display. Variety Is The Spice of Life (and Hill Climbs)! To illustrate the fact that Prescott is not just about Bugatti’s and other vintage cars here are just some of the wide range of other cars (and one special motorbike) in action. The period of austerity immediately following WWII saw a move away from the pre-war heavy engineering behemoths with girder chassis and massive aero engines to a new lightweight 500cc Formula 3 race series. Adopting pre-war cyclecar and voiturette concepts of light weight chassis powered by motorcycle engines the new F3 cars also adopted the revolutionary concept of positioning the engine behind the driver. Whilst this seemed to emulate cars such as the Auto Union it was really just a practical solution to having the engine and chain drive nearest to the rear axle. 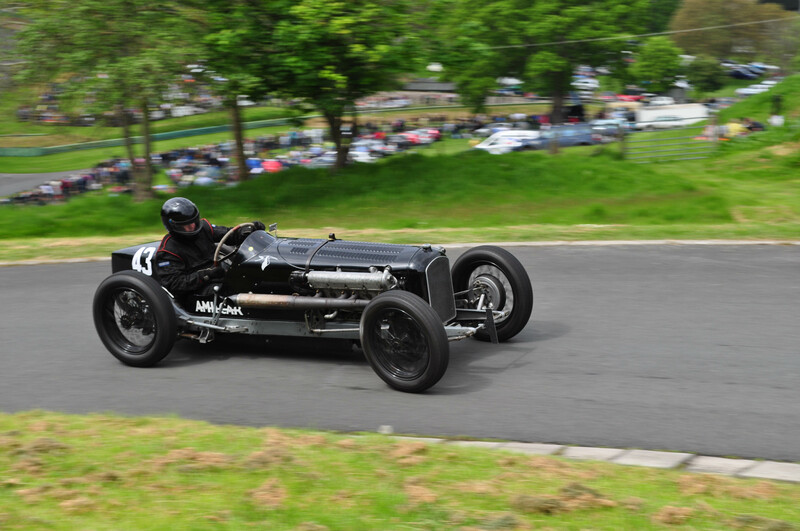 Prescott provided a great field of hard driven 500cc cars – most but not all with J.A.P. engines. To me – the curvaceous mid engined layout of the Cooper, Iota and Staride cars in particular with their bare alloy bodywork made them look like massively scaled down pre-war V16 Auto Unions albeit with a deficit of 15 in the cylinder department! There was a great turnout of Morgan 3-wheelers old and new and even some Moto-Guzzi engine Morgan replicas in the spectators parking area. As the Moggy’s are raced under a motorcycle category the de-rigeur race clothing for the day was full motorcycle leathers and full face helmets for driver and passenger (aka riding mechanic). Much to the consternation or alternatively relief of the driver’s wife/girlfriend/husband/boyfriend – ballast could be used instead! Looking like something Batman should be riding to hunt down crooks in Gotham City – this bike was taken very carefully up the hill on a couple of demo runs. The sound of the Zef Eisenberg helicopter turbine bike engine was quite incongruous but there’s no doubting its power as it holds the ACU British Land Speed Record (Turbine Powered Category) with a speed of 205.87mph. I had a great day out, saw some great cars, spoke to some really interesting people and will go again to Prescott and other hill climb venues. One gentleman I was chatting to recommended I try Shelsey Walsh next on the basis that it’s a faster course than the more tight and technical one at Prescott. Can’t wait! See accompanying “Prescott – La Vie En Bleu” Post. “I admire the inspired lunacy that leads people to insert enormous aircraft engines into crude ladder chassis with sometimes vestigial bodywork and feeble brakes.” Beautiful writing, Phil! Not sure if you spotted it but some of the aero engine cars don’t have front brakes.